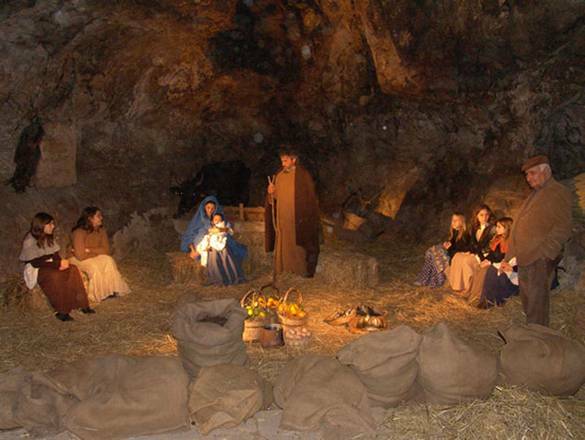 This year again, the town of Custonaci , in the province of Trapani, will realize his famous Nativity Scene in the village of Scurati and in the prehistoric cave Mangiapane. The Nativity Scene of Custonaci is an important event which helps to preserve and pass on the cultural heritage of the ancient crafts and the Sicilian tradition. Scattered in the small cottages of the ancient village, among the 80 people present, you can see at work “u scarparu ” (shoemaker), “u pignataro ” (the potter), you can see “u furnu “(the baker), “U tilaru “(the weaving loom), the tavern, the ancient machine to knead the pasta and many other places of the ancient Sicilian tradition. The representations of the Nativity Scene will take place 25 – 26-27 – 28 to 29 December and 4-5 and 6th of January .